I couldn’t stop staring at the emotion in their eyes – all of their eyes. It must have been an abnormal amount of time to stare into a storefront window, because soon an elderly man unlocked the bolted door, and behind the solid bars he stood, inviting us in for a closer look. Without hesitation I followed the eyes of the portraits up a couple of stairs until inside. The gallery was filled with so much color, intense shadows, and piercing looks, I knew there had to be a story behind this artwork. There were many women with painted faces or beads woven in their braids, I knew from my previous time in Africa that these must be symbolic to their tribes. Some I could recognize, others were foreign to me. But the first canvas that spoke to me was a woman without any paint or beads; just in her natural state. She was leaning over her shoulder, sensually, puckering her lips until completely full. But her eyes are what captivated me, they were fierce, showing her independence, yet her longing for love. ‘Aww….the Himba women’, the art gallary consultant smirked, pointing to her, then looking back at me. Almost like he wasn’t surprised I would resonate with her. I hadn’t heard of that tribe before. My silence must have informed him of my lack of knowledge, so he shared stories from the Himba tribe, further bringing the painting to life. The emotion in the painting is justified as I learned about the power these young Himba women have. 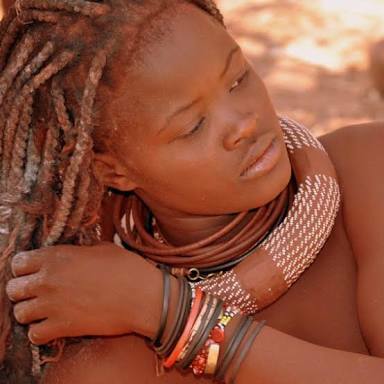 The Himba women decide independently when to have a child. It’s a meditative, seclusive process where she goes off and sits under a tree, alone she listens to nature, passing people, and the higher power until she hears the song of the child who wants to enter the world. Once she hears the song of her child, she returns to the village to find a man who will be the child’s father. She teaches him the song, which can take weeks or months. If she is convinced he can sing her child’s song, then she falls into his arms. They then make love, singing the song of their child as a way of invitation. Once the Himba women becomes pregnant she teaches the village her child’s song, singing it often as a way to connect with her baby. This song remains the child’s for the rest of their life, sung as a gesture of verbal protection, praise, a right of puberty, and a way of honoring this person. When that child chooses to marry during their marriage ceremony, there will be a beautiful collaboration of two unique songs being song together. Representing two independent lives coming together, forming a new even sweeter song. However, that original song given to them by their mother doesn’t fade until a Himba villager takes their last breath. On this day, the entire village honors their life by continuously singing their unique song. I hold onto this story for awhile longer and let it sink in. I’m in shock. Everything that the media shares have skewed my personal perceptions of Africa of being outdated, violent, and unfair, especially for women. And this shatters that perception. But that’s the issue with modern day media; they believe humans will resonate with stories filled with hatred and fear, instead of stories of empowerment and tradition. Once again, I am speechless. I take many moments before answering. I think to myself and reject on the last couple of days. There’s clearly still injustice. There’s still too much poverty. There’s still racial division. Yet there’s still a pride in their country, and there’s still warmth in their smiles. There’s still untold heartwarming stories. And there’s most definitely still motivation to bring back pre-aparttide culture and community. Unfortunately, still a one-sided story being told by the media. So what really had changed. Granted this visit to South Africa had only been for a couple of days, yet in that time my mind had frantically been doing a lot of self reflecting, especially back to the contrast of who I was in 2011. My naive self roamed the streets of South Africa wearing an I heart S.A ball cap and a bright pink tank top that read I love my boyfriend. I drank way too many Savannah ciders and danced in the taxi car with my fellow classmates. At the time, I had limited life experience. I hadn’t experienced any hardships, hadn’t taken any risks, and had zero concept of money. Back then, I appericiated learning the facts about South Africa’s history, but didn’t let myself emotionally fall into all their stories. Standing in this gallery I can feel my emotional intelligence in high gear, soaking in the ‘songs’ of each painting at the African Gallary and of each person we had the pleasure consume their stories thought out this journey. It was in that moment that I realised when you let go of what you think you know, and instead just listen to the songs of the native people, it’s a beautiful vibrant eperience. One that can only truly be recaptured through a piece of artwork.